Do you remember the dark days before the invention of single serve coffee makers? When some homes had multiple coffee pots going, to accommodate decaf or regular, strong or weak brew? Or, more horrifyingly, instant coffee was prevalent, to allow for cup-by-cup customization? Given that they are now sitting in seemingly every office and home in America, you probably wouldn’t guess that they didn’t really take off until the turn of the millennium. Keurig created and dominated the market at first, but other manufacturers have caught up, making the market as cluttered as a countertop of used K cup pods. Better yet, single serve coffee tastes better than ever, now offering coffee that all but the pickiest of coffee drinkers will gladly consume. Whether you’re looking for your first or your fifth single serve coffee maker, let our reviews help you choose the right one for your home (or business). 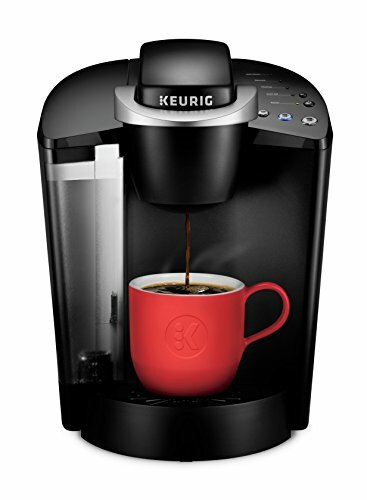 The Keurig name is synonymous with single serve coffee makers and the Keurig K55 is another notch in their belt. They’ve clearly produced this model with customer feedback at the forefront of the design process. The giant, 48-ounce reservoir can make several cups of coffee, of varying strengths, one right after the other. The drip tray is sizable enough to hold an entire cup of spilled coffee. The user interface, from set-up to daily use, is friendly and intuitive. It accommodates the travel mugs we all seem to be carrying nowadays. And it accepts the pods of competing brands as well as freshly ground beans. People do complain about it being loud, perhaps noticeable because Keurig has silenced the family dinner table debate about what kind, flavor, and strength of coffee to make. This model carries on the tradition and is an obvious Top Pick. 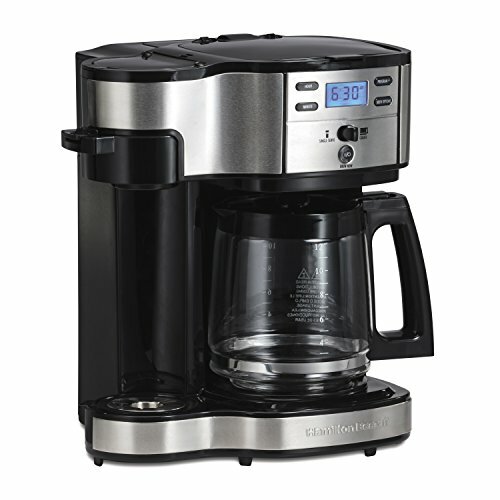 The Hamilton Beach 49980A seems like an obvious invention – it has both a single serve and a 12-cup carafe capability. Owners of this machine nearly worship it as the solution to years of household squabbling over coffee preferences. Whether you’re hosting a crowd, or filling your travel mug before trekking to work, or even both at the same time, this Hamilton Beach has you covered. The single serve size accommodates nearly any cup, travel, or household mug, and the carafe side is programmable, so you can have a pot waiting when you wake up in the morning. Alas, on the flip side, there seem to be quite a few unfortunate owners whose machines simply stopped making coffee. If not for the reports of these lemons, this model might have had a better chance at being our Top Pick. At its most basic level, all you need a single serve coffee maker to do is . . . make a single serving of palatable coffee. The question becomes – what else do you want it to do? Nowadays, they all accommodate readily-available pods of some type, meaning you can have coffee, tea, or hot chocolate, and most let you use your own coffee grounds as well. They all are intuitive to set up and use. They all allow some choice of brew strength and cup size, including travel mugs. How many people can it accommodate? Do you need to dispense an endless stream of individualized hot drinks, or do you only need enough for one or two people? Coffee makers can be found that do either. How long does it take? Really, they’re all significantly faster than waiting for a 12-cup carafe to brew, but if you are by nature impatient, you might want to compare brewing times. How big is it? Are you leaving it out on your counter, or do you want to put it in a cabinet when you’re done with it? Once you’ve figured those things out about the models you’re researching, you’re ready to make a decision. Keurig remains the gold standard in single serve coffee makers, with the Keurig K55 winning our Top Pick spot. A triumph of design, it anticipates and meets virtually all your coffee (and other hot beverage) needs, whether you’re serving one person or six, with a minimum of human effort. There’s a reason this brand is eponymous with this product. If it’s just you, you can’t go wrong with our Best for the Money choice, the Hamilton Beach 49981A. If all you want is a small, inexpensive appliance that fills your travel mug as you’re running out the door every morning, this is an obvious choice. 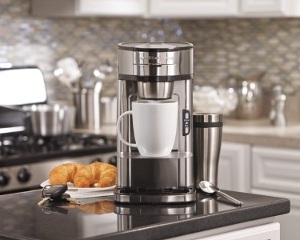 The single serve coffee machine lets every coffee drinker get exactly what they want. We hope our reviews helped you do the same. 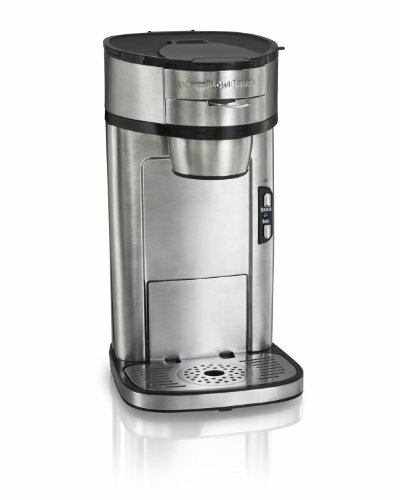 Which is our all-time favorite single-serve coffee machine no matter the budget? Keurig K55 vs K250: Which One’s Best? Automatic vs Semi-Automatic Espresso Machine: What’s the Difference? Should Kids Be Allowed To Drink Coffee – What are the Disadvantages?